A 12-year old-girl was arrested for attempted armed robbery in Highland Township, Michigan last week. Why would a 12-year old girl try to commit armed robbery? Drugs? No. Barbie dolls? No. A trip to Disney World? No. The father of a 12-year-old girl arrested for an attempted armed robbery says his daughter was trying to get money to make house payments. The father told Local 4 he and his wife are going through a terrible divorce. He said his wife informed him of the arrest and he went crazy. But the father told Local 4 the girl had a motivation to commit a robbery. “Her mother told her that I was taking away the house that they live in, which is absolutely false and she was trying to get money to pay for the house is what I heard. It’s terrible,” the father said. In a 911 call obtained by Local 4, a woman can be heard telling a dispatcher Friday night that another employee is holding down a crying masked girl who just tried to rob the store with a gun. 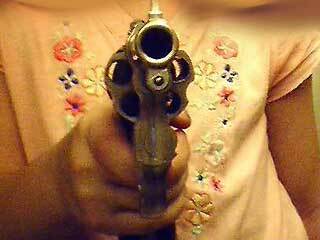 The girl, whose father said turned 12 years old last month, has been charged as a juvenile with armed robbery. 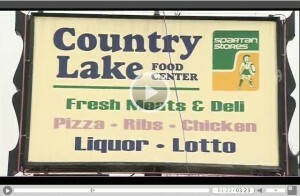 Police said she stole a gun and used it to try to take cash from Country Lake Market on North Milford Road. A loaded 9 mm handgun was recovered at the scene, police said. The 12-year-old is being held at Oakland County’s Children’s Village without bond. Her preliminary examination hearing is scheduled for April 26. Just wow. At the very least I hope they remove this girl from her mother’s care and award custody to the father. The mother should be sent to jail as an accessory for armed robbery. Just wow. Another shining example of how some parents act “in the best interests” of their children. Can we all stop pretending that Parental Alienation isn’t real now? And tomorrow she’s going to wonder why life is so unfair to her…. Professional victims are sooooooooooooooooooo tiresome. Sadly, the mother no doubt believes her own BS. They are the best definition of what a stupid fool is. In the end they become victims of their own delusions making their own lives such a convoluted mess that they will never get out of their own misery. They complain of inner emptiness and are terrified of abandonment, and yet they are the best example of a self fulfilling prophecy that I have see yet. You have to be careful with what you say to children. While I was still struggling after leaveing AXH, I used to always say, “We can’t afford that.” My elder daughter took it upon herself to try to raise money in all sorts of unique ways…I finally realized that because of that phrase I was using, she somehow felt responsible for helping out. She was 9 or 10 at the time. I now say, “That’s not a [financial] priority,” or even “It’s not on the list. Maybe another time.” Which makes it more like a choice (which in reality, it is) rather than helplessness. I have wondered, they say children of divorce have all sorts of psychological problems…but I wonder, is it the divorce itself, or all the crap going on in the house BEFORE the divorce (which the divorce magnifies), that causes the damage? A little of both, I think, especially when you add in the crap that goes on after the divorce. For a lot of divorced children, the divorce is never over. We all know that children of divorce often feel like they have to take responsibility for the family (Dr. T, is there a psychological term for this? ), and it’s been my observation that a lot of divorced parents play into that. The poor kid winds up with a lot of the responsibilities of an adult, but none of the privileges and benefits. I think it’s very harmful. 6. The good son or daughter. They see how upset and out of control your ex is and want to take care of and make her or him “better.” They try to do this by doing what your ex wants, which is being hostile toward you and/or excluding you from their lives. This creates what psychologists refer to as the parentified child. Parentification forces a child to shoulder emotions and responsibilities for which she or he isn’t developmentally prepared and is also a form of child abuse. Emotional parentification is particularly destructive for children and frequently occurs in parental alienation cases. The custodial parent implicitly or explicitly dumps their emotional needs on the child. The child becomes the parent’s confidante, champion/hero and surrogate for an adult partner. This is extremely unhealthy as it robs children of their childhood and leads to difficulty in having normal adult relationships later in life. I agree with this concept. However, I think society has taken it to the other extreme as well given the amount of narcissism we are seeing in our youth. A lot of the time a free ride is given throughout childhood by a child having no responsibility or accountability. Children aren’t being taught either how to express love and nurture age appropriately within the family system much either. It is all too often described as codependent behavior; which is a movement that is pseudo scientific and has caused a ton of damage from the psychology industry. don’t get it that love has a definition and abuse has one too. Children aren’t being taught either how to express love and nurture age appropriately within the family system much either. It is all too often described as codependent behavior; which is a movement that is pseudo scientific and has caused a ton of damage from the psychology industry. Would you mind elaborating and providing an example or two of what you mean? One example is a person I knew who was told by their therapist that the family was dysfunctional because a child of 7 made sandwiches for their 5 year old sibling. According to this therapist the children had codependency issues because of this. The 5 year old should be making their own sandwich. It is good that the 5 year old can make their own sandwich, but there is nothing wrong with the 7 year old showing love and caring for a younger sibling at all. Or vice versa. The term codependency started with AA. The problem with AA and that term is that the person who started AA was and is still thought by a lot of people in the field to be a severe narcissist. Codependents have no clear answer on what it really is. Anybody can be one. They ignore the need for people and interdependency as well. The end result is often how to become a narcissist depending on who is interpretating it. I believe AA is a cult. Dr. Michael Langone is a psychologist who is a cult expert. His work and others in this field might be useful if you are interested in studying more on AA , codependency or any 12 step program. Dr. Scott Lillienfield is known to be a stickler on advocating that psychology should be using scientifically studied psychotherapies and is excellent at debunking trends, models and movements as well. If I am not mistaken he has work on the Internet on codependency as well. Both men are highly respectable. I have personally spoken on the phone with Dr. Michael Langone about cults, and I have found him to be down to earth, very bright, astute and accurate. I have known many people as well who were clearly severely damaged by 12 step programs. They had the complaints Dr. Langone describes so well in his work. Thanks for your explanation. I think I understand your point better now. Pathologizing a family because an older kid is looking out for a younger sibling seems pretty warped to me too. I guess the issue is the difference between codependency and interdependency. It sounds like the therapist you described was treating them as the same thing. I don’t have any experience with AA, but I’m intrigued by your comments about it and will probably look further into these critiques. I agree with Cousin Dave that it’s a combination of both. HCPs/APDIs are abusive and crazy during the marriage. Divorce ignites all their control, fear of abandonment, fear of criticism fear of exposure issues and they become even more demented during and after the divorce than they were before. The crap that went on during the marriage is the foundation for the Crazy happens once the divorce begins. I bet the sicko mother now feels even more vindicated and victimize (at her daughters expense), as she blames the father for this horrendous outcome. What’s worse is the poor child likely identifies very strongly with her disordered mother and loathes her father. Nauseating. Insidious. Child abuse. No words. The more I think about this, the worse it gets. It’s just terrible. The best part of all is that the girl now, presumably, gets to go to juvenile detention where she can learn how to be a better criminal. So everybody is hosed. Mother’s Day is less than three weeks away. I’ll bet that holiday’s a trip in that household. I’m sure they all bow down and pray at the Altar of the Golden Uterus. It looks to me that her father is making an excuse for her behavior instead of supplying a reason. I don’t see him saying that she was wrong no matter what. Maybe the father isn’t the best option to be a parent either. I often see splitting and responsibility problems in people who have been in relationships with a Cluster B.
I’ve read that the dynamics of these types of families, i.e. where one of the parents is a BPD or other HCP, is very similar to families of alcoholics. Very often the non-alcoholic parent is codependent, or otherwise an enabling or accommodating personality. It seems like the same dynamic could be at work here. Most alcoholics have at least traits of narcissism if not full blown PDs. I made a statement on my belief of the term codependent above if you are interested in reading it. I have some education from a university on alcoholism, and I am very leary and largely in disagreement with what the books on the book store shelves have to say about it. They are usually not in accordance with competent science. I had a father with BPD and a sister as well. I fit the profile of Theodore Milon’s description of a healthy personality which is the really a Dependent PD without the pathology. I have to strongly disagree with your overly general and broad statement on how children of BPD’s turn out. It is important to remember that people do not fit into neat categories for the most part. A clinician’s opinion or experience is not always fact when they state what they state either. I wasn’t talking about the daughter, I was talking about the father, although I may not have been clear about that. On further reflection, I’m not sure that the father is an enabling type – he sounds more traumatized, bewildered and sad to me than anything else. In either case, I wasn’t making a statement about how the children of BPD parents turn out. While what the girl did was wrong, based on what we know from the news report, it appears to be the result of the mother’s lies and manipulation. The girl has to be held accountable for her actions, but so does the mother. I also agree with Cousin Dave’s point. Talking to a reporter is a stressful experience even in the best of times. Plus, it’s also quite common for a reporter to get several minutes of interview time, then pick and choose a few 5-7 second cuts to put into the story. There’s a very good chance the father said a whole lot more than just what was aired. B, that could be. However, it also could be that the father, having been blindsided by what happened, was still trying to process it when some reporter stuck a mic in his face. He said the first words that popped into his head. What will really matter is what he will say to his daughter after the immediate problems — bonding, bail, pleas, etc. — get taken care of. True and very fair to the father Cousin Dave. I hadn’t thought of the shock factor he could have been going through. It blew my mind just reading it. It’s one of those things where, when you read about it, you think, “What would I have done in that situation?” If someone knocked on my door and told me that my 12-year-old daughter had been arrested for armed robbery, my first reaction would be to start looking for Allan Funt (middle-aged person cultural reference there!). Unfortunately, there’s seldom any media follow-up on stories like this, so often we don’t know the complete situation. It’s absolutely not unheard of that both parents would play PAS games against each other, and then one of them will whip out the poor-me act when the other one screws up and gets caught. I’m not getting that vibe out of this particular situation, but your original theory is certainly not impossible.